Today, the Presbyterian Church of Canada, one of our sending churches for EAs in Canada, shares why they participate in EAPPI. What’s your favorite thing about EAPPI? The ecumenical nature of the program encourages unity of purpose. 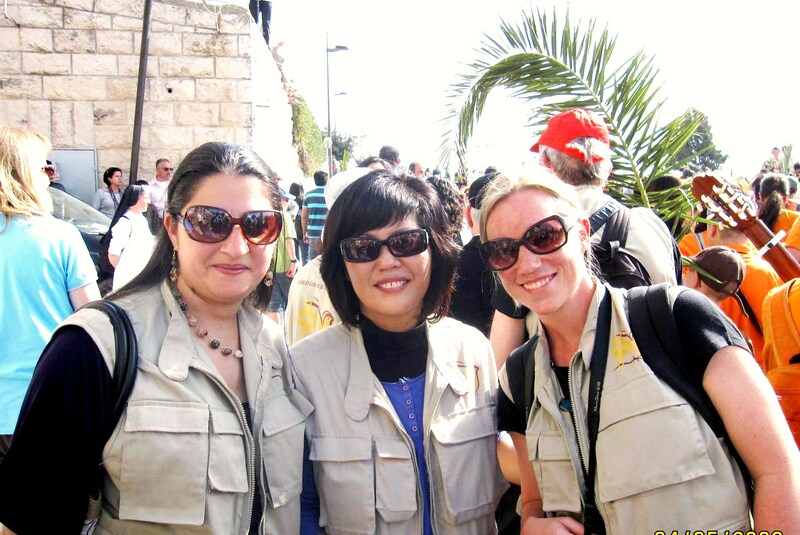 In the field, EAs establish that human connection with local communities while working together for peace with Palestinians, Israelis and other organizations in the area. Over the years, the EAPPI has been able to build its capacity especially in the production of advocacy resources for use by EAs for increased awareness. What beliefs motivated you to get involved with EAPPI or the Palestinian/Israeli conflict? The PCC’s fundamental belief is that all human beings are created equal in the image of God and that an injustice to one is an injustice to all. After the 2nd Intifada, the PCC and other churches realized that if peace was to be achieved, the church had to exercise its prophetic voice, be an active participant in the search for a just peace and reconciliation and put a human face to the suffering in the West Bank. 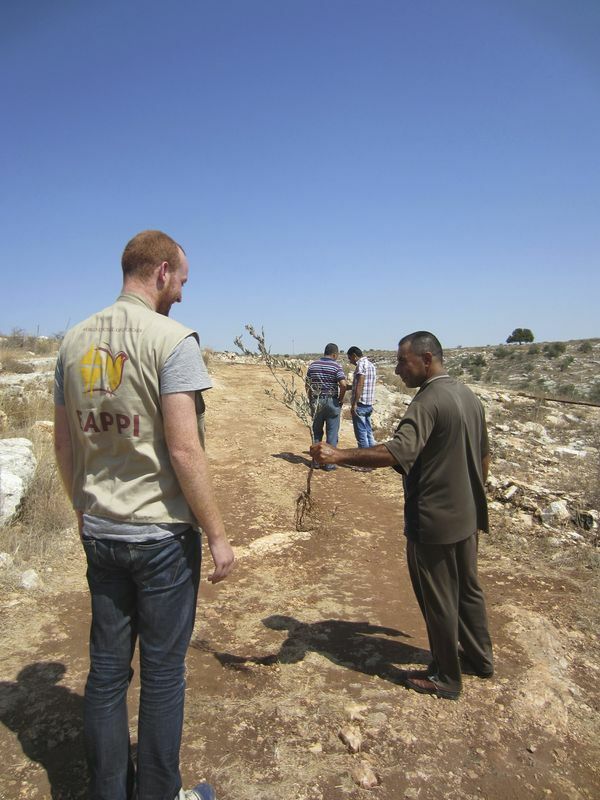 Why do you support EAPPI as opposed to other organizations working in Israel/Palestine? 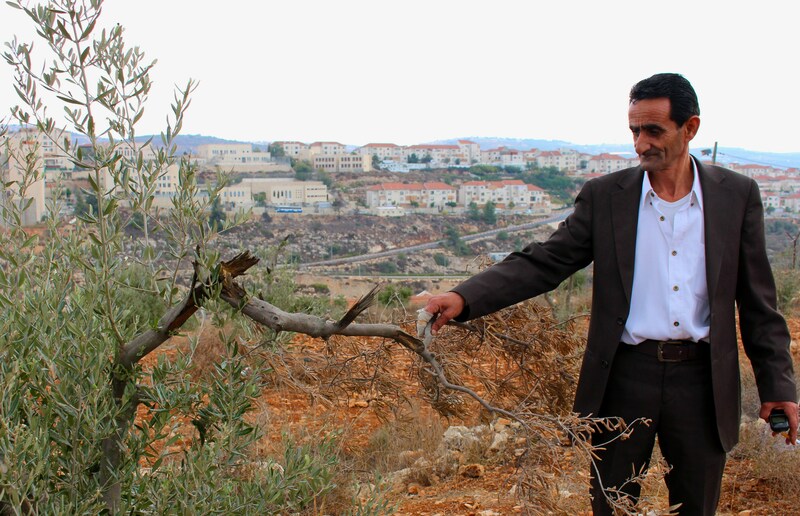 A Canadian EA listens as a farmer describes the destruction of his olive trees by Israeli settlers. Photo EAPPI/J. Fraser. In its operations, the EAPPI emphasizes impartiality and cooperation in its recognition that there are both Palestinian and Israeli communities committed to justice, peace, and respect for human rights and that the marginalization of any of them will hinder its work. 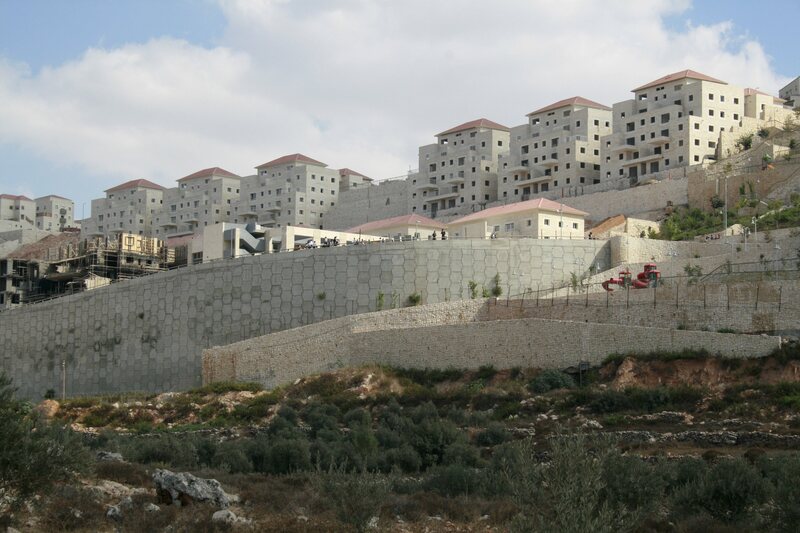 As an organization and partner, the EAPPI has made great strides in achieving its objectives of ensuring an international presence in the occupied territories with cooperation from the countries that send EAs to the West Bank. EAs monitor checkpoints many days per week to observe and gather data on incidences that threaten peace. It is this constant presence and accompaniment that distinguishes the EAPPI from other organizations. The EAPPI presents an incredible opportunity to EAs to monitor human rights abuses at the grassroots level. EAs listen to many local stories from communities with an open mind; actively participate in their everyday routine like sharing meals while empathizing with their daily struggles. What do you think needs to be done to end the occupation and achieve peace in Israel and Palestine? More governments should show commitment to peace in Palestine & Israel through deliberate engagement with both Palestinians and Israelis in all aspects of their lives so that global collective actions may influence policies that reflect equality, tolerance, self-expression and co-existence. In a sermon on the occasion of the 10th anniversary of the EAPPI in November 2012, His Grace Bishop Dr. Munib Younan expressed his hope that one day both Palestinians and Israelis will recognize each others’ humanity and interdependence in order to achieve a just peace. Why should a Canadian be involved with EAPPI or the Israeli/Palestinian conflict? 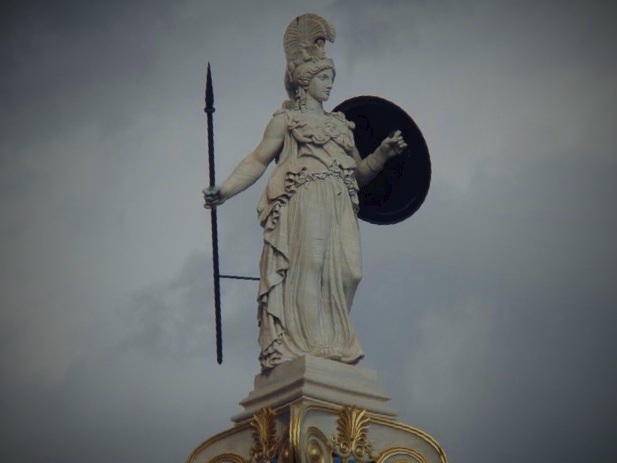 The PCC believes strongly that there can be no peace without justice. The concept of protective presence is based upon the idea that an international person has more of ‘voice’ than the average Palestinian and that this ‘voice’ can help deter or minimize instances of human rights abuses. Canadians can use their ‘voices’ and presence to accompany Palestinian brothers and sisters. The message of just peace is more effective when it is based on eyewitness accounts and every little bit counts. Thank you to Margaret Zondo, Program Administrator for International Ministries of The Presbyterian Church in Canada (PCC) and EAPPI Coordinator within this denomination, as well as Jeanie, Jake, and Magan, former EAs, for contributing to this article! Do you want to know what EAPPI is doing around the world? Read more from Australia and the UK & Ireland. How can you understand the Israeli/Palestinian conflict without seeing it for yourself? EAPPI staff, former EAs and local partners attended the World Council of Churches (WCC) 10th General Assembly in Busan, Korea from October 30 to November 8. 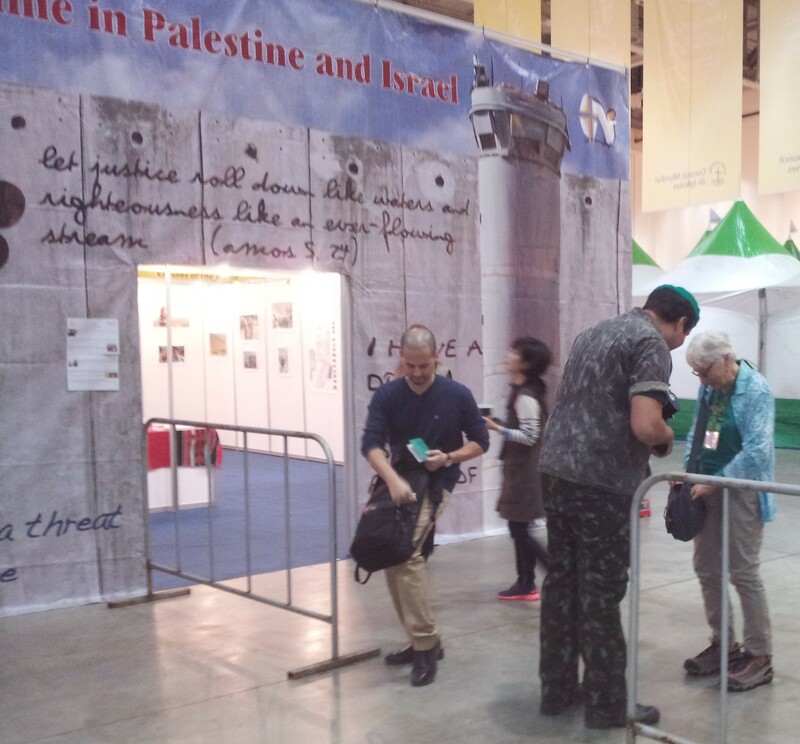 The booth, featured a photo exhibit and short films of EAPPI’s work and the situation in Palestine. 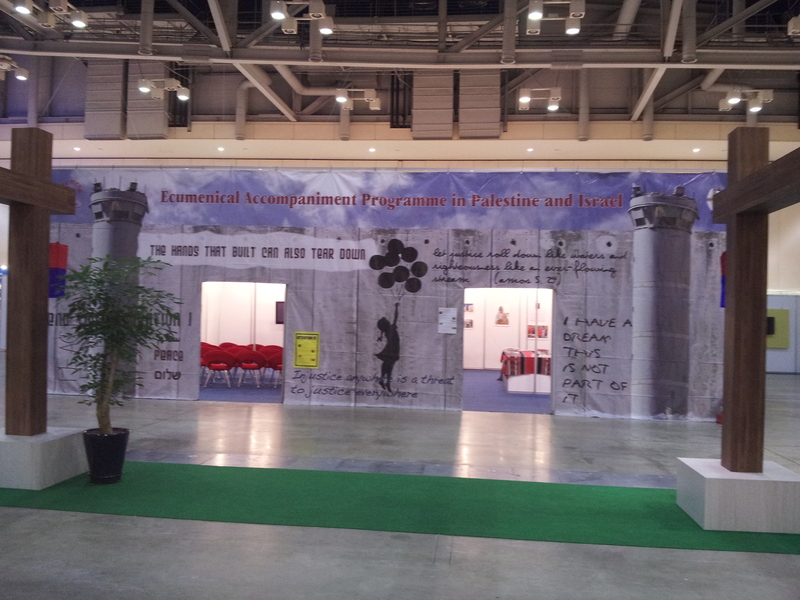 A banner of the separation wall hung over the entrance to EAPPI’s booth at the WCC 10th General Assembly. Photo EAPPI. Participants had to show their IDs before entering through the separation wall. Photo EAPPI. Before entering, however, participants had to go through a façade designed as the separation wall, where participants could write message of peace and add their own graffiti. 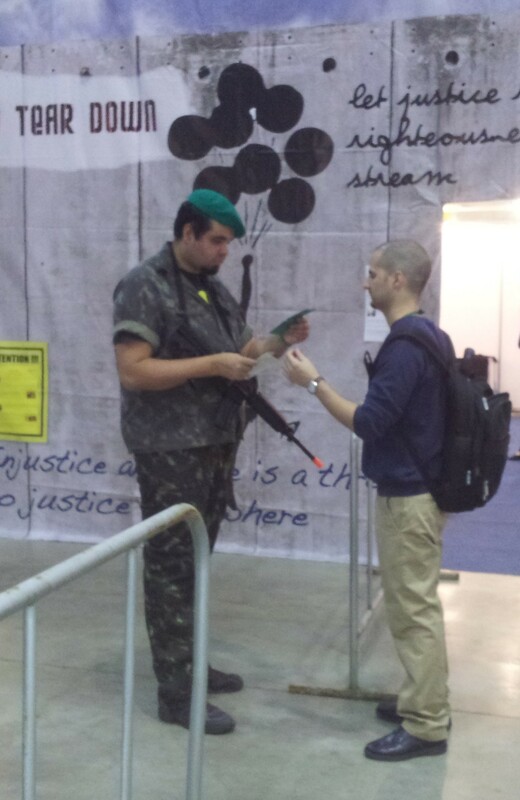 A soldier (a former EAPPI observer) guarded the entrance, asking to check participant’s ID’s. “Are you Palestinian,” he asked. If not, he would allow them in. If so, he would not. Every evening in the booth, participants could join for tea time. “We served sweet mint tea and cookies and discussed issues like ‘Palestinian children and the right to education,’ the ‘arbitrary use of violence against Palestinian children,’ ethical pilgrimages to the Holy Land, and access to worship. “Are you Palestinian,” the soldier asked. If so, you could not enter the booth. A reflection of the restrictions on movement that Palestinians face every day. Photo EAPPI. The main event focused on access to education. Adli Daama, Learning for Development Officer at UNICEF, discussed the overall context of education under occupation, while Rafeeq Zeineldeen teacher from Qabalan school near Nablus, focused on his school’s experience and the affects of occupation on his students. In addition, two former EAs discussed their experience in the West Bank and how people on the ground are affected. An EA walks near the separation wall in Bethlehem. Photo EAPPI/G. Galmen. 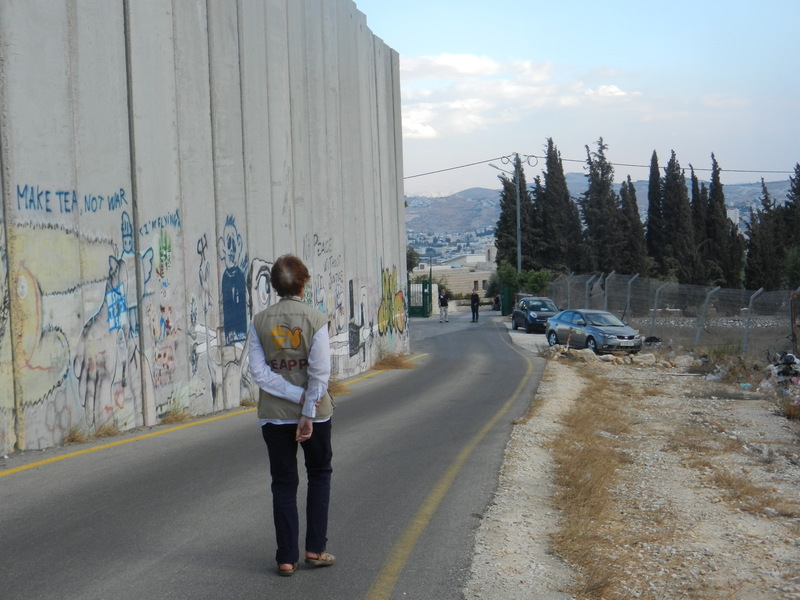 This year for the World Week for Peace in Palestine and Israel, many of the EAs joined in a service with the Benedictine Sisters at the separation wall in Bethlehem. Bethlehem – where Jesus was born in a country the Romans occupied at that time. Bethlehem – still under occupation today, but now where freedom to travel is more restricted than it was for Mary and Joseph 2000 years ago. 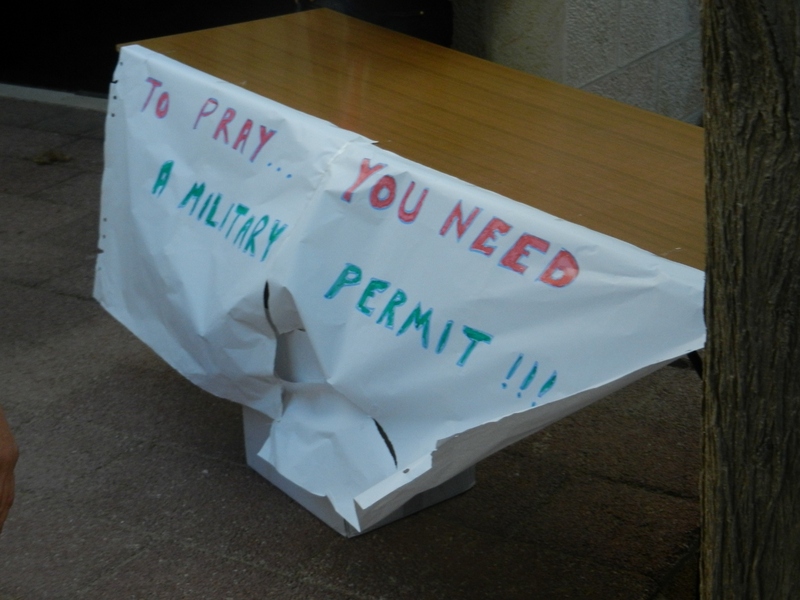 At the service, each of us was issued with a “permit” which allowed us past the “barrier” into the monastery where we could worship. This action was a sobering reminder of the continuing difficulty Palestinians, both Christians and Muslims, who have restricted access – their Holy Sites, face. Worship began with a reading of a letter church leaders wrote last Easter concerning this reaction. Then, several local ministers from various Christian traditions, led the packed congregation. 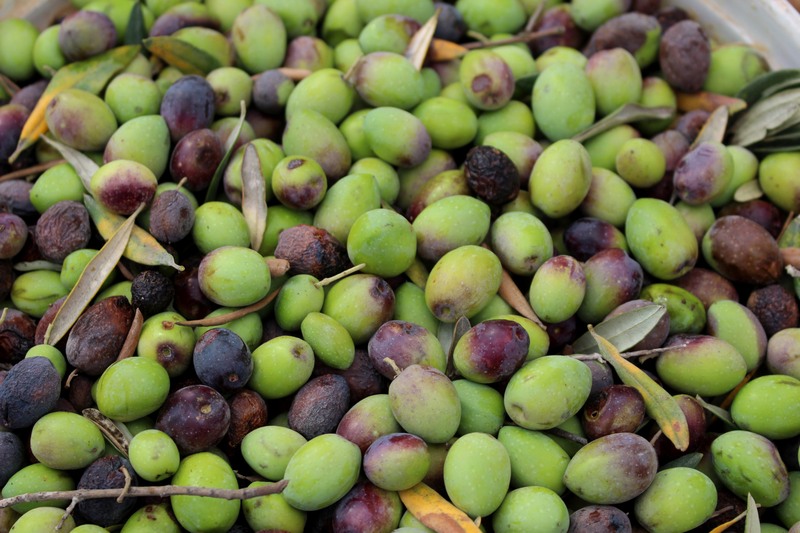 We exchanged the peace along with olive branches, traditionally a symbol of peace. For me, olive branches have an even deeper resonance with the very life blood of this land, particularly as olive harvest approaches. The destruction and uprooting of olive trees by the Israeli occupation is not only an expression of ecological disrespect and vandalism, but also an insult to God’s creation and people who, despite their oppression and suffering, can still extend their hands with an olive branch to soldiers and oppressors. May God bless you with discomfort at easy answers, half-truths and superficial relationships so that you may live deep within your heart. May God bless you with anger at injustice, oppression and exploitation of peoples, so that you may work for justice, freedom and peace.